42-foot white fir comes from Grants Pass, Ore., courtesy of Consumer Fire Products Inc. 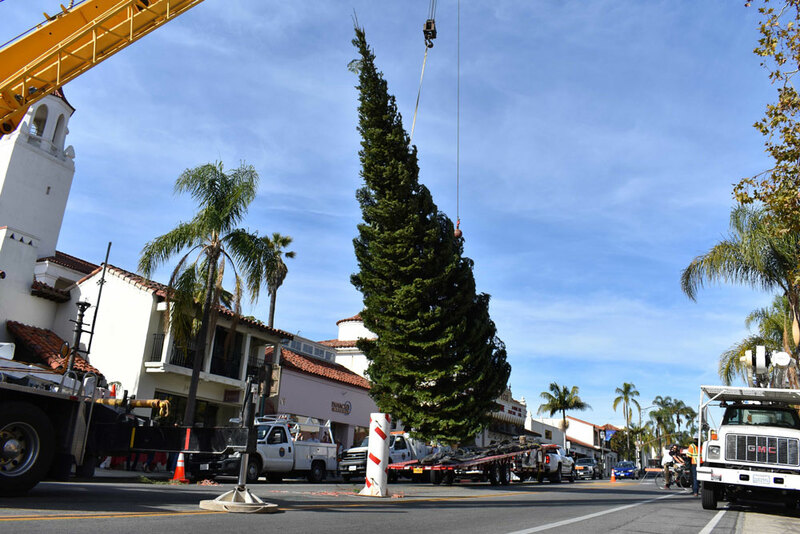 The holiday tree that will illuminate a downtown Santa Barbara intersection arrived Tuesday near the Arlington Theatre, but the festivities won’t kick off until next week’s tree lighting and annual nighttime parade. The 42-foot white fir comes from Grants Pass, Ore., and it was donated and transported to State Street by Consumer Fire Products Inc., the holiday parade’s presenting sponsor. The massive evergreen was harvested by helicopter as part of a forest enhancement program, according to Jennifer Zacharias, principal of JZPR. Zacharias said 10 trees are replanted for every one tree harvested. Before the tree was fastened to its base, special care was taken to protect it for the journey to Santa Barbara. The branches were tied to the trunk, and it was suspended from a crane. Bragg Crane and the city’s Public Works Department helped with the tree installation. The tree will be lit during the 65th Downtown Santa Barbara Holiday Parade, which begins at 6:30 p.m. Dec. 1 at State and Sola streets. This year’s parade theme is “Colors of the Season,” and it will feature hundreds of participants, including marching bands, holiday-themed floats and local performance groups. The grand marshal is actor Noah Wyle. Event organizers expect more than 65,000 parade spectators to line State Street.